It used to be normal for me that I spend quite some time with preparation before I went for longer photo trip, but last year trip to Iceland, was a little bit new experience in this respect for me. I really did not have too much time to prepare myself, so when I landed in Reykjavik I had very little idea what to expect and where to go. 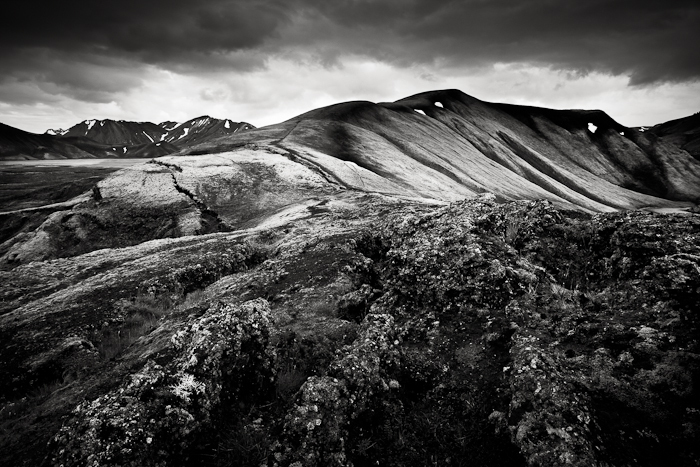 I took this picture at the end of rainy day in Landmannalaugar, which actually become my favorite place on Iceland. We were quite lucky that the rain subsided for a while and setting sun lit up the whole area around us with a nice warm light. Unfortunately this stunning moment did not last for long, but still the sun was able to reveal the rugged surface of Icelandic landscape. I had couple of options how to use the brief period of light in my photograph. Since, I was so amazed by the unusual character of the landscape I decided to find some interesting rock formation to place to the foreground and then it was quite easy to fill the rest of the frame with sunlit mountains and dramatic sky.